Would you like to try Newton’s classic speed of sound experiment? 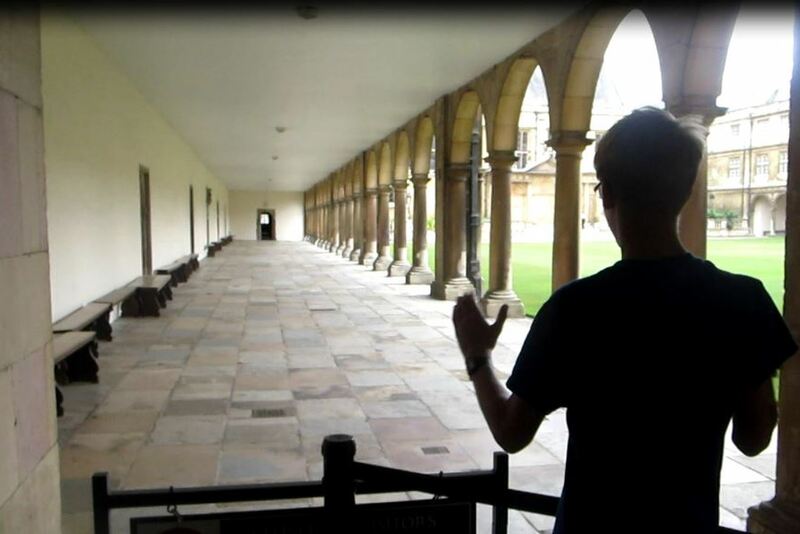 Last month, at Trinity College in Cambridge, my 13-year-old stood at the colonnade where Newton measured the speed of sound. Just like Newton, Daniel clapped his hands once and waited for the echo. Unlike Newton, we used electronics to measure the time it took the sound wave to travel down the outdoor corridor and return to our ears. It seemed almost (but not quite) instantaneous. We recorded the sound of the clap and the echo. Later, using a simple sound-editing program, we found the amount of time that it took Daniel’s sound wave to traverse the corridor and return. It was fast. It took just 0.37 seconds. 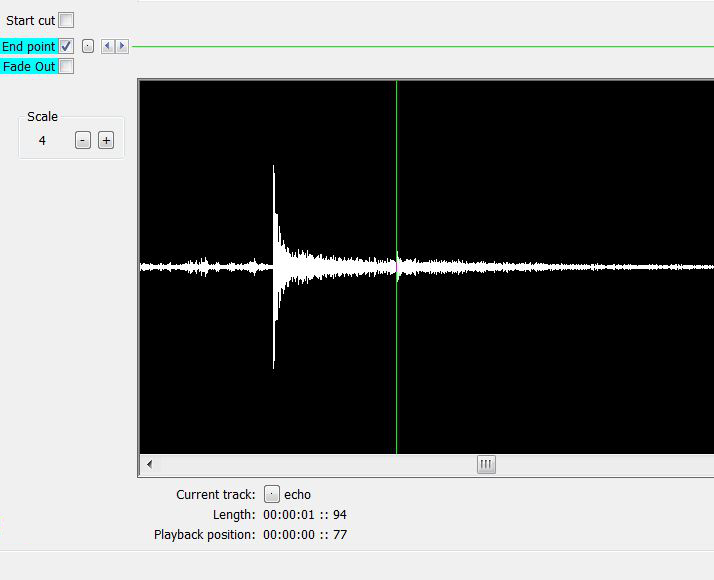 The hand clap, the major peak, occurred at 0.40 seconds, while the echo is heard at 0.77 seconds. Therefore, it took about 0.37 seconds for the sound to echo and return from the far wall. We couldn’t measure the length of the colonnade (which is visible in the top picture) because a security guard bloke denied us access for this important part of the experiment. Besides, we had forgotten our measuring tape back in Calgary. However, we found prints of Trinity College’s floor plan. The length of the colonnade turned out to be about 64 metres. So, the round trip for the clap’s sound wave was 128 metres. Knowing distance and time, it’s a simple step to calculate speed: speed = distance/time = 128m/0.37s = 346 m/s. The accepted nominal speed of sound, at sea level, in dry air, is 343 metres per second. Our observation was within 1% of the accepted value. We did better than Newton, who calculated the speed of sound at 298 m/sec. He was off by 15%, but he didn’t have any easy way to measure a tiny time interval such as a third of a second – though I suppose no one stopped him from measuring the colonnade’s length. Newton was the first to publish a speed for sound (in 1686) and to show how he made his calculation. He used a small pendulum to measure the amount of time the echo took. This method was much more accurate than any 17th-century clock, but was cumbersome and finicky. It was well known that the back and forth swing of a long pendulum takes a longer period of time than short pendulum. The formula used by Newton relates the constant force of gravity (g) and the pendulum length (L) to the pendulum’s period (T). It’s not a tough calculation (though the derivation of the formula was sheer genius). This is what Newton used: T = 2 PI SQRT (L/g). Newton changed the pendulum length until it’s swing period was the same as the echo’s return. These match using a 3.5 centimeter length. Plugging numbers into the formula gave Newton the time, which he calculated as about 0.42 seconds. His speed of sound was too slow. 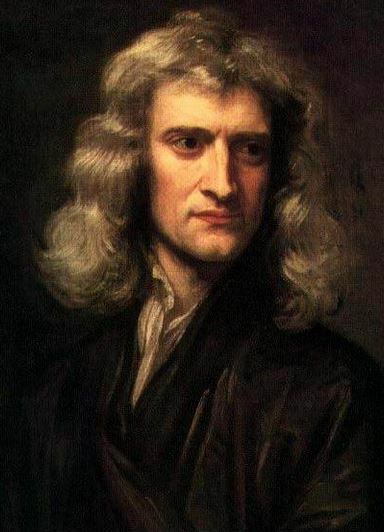 Sir Isaac Newton, about the time he was studying sound at Trinity. We should also note that Newton had assumed that sound waves are isothermal. Laplace, 1816, suggested that sound waves are not isothermal but adiabatic. The work of Laplace corrects Newton’s measurements and resulting speed of sound calculation. Other factors (Cambridge’s elevation and the temperature and humidity of the air) would have also changed the speed of sound in Newton’s original experiment and contributed to his discrepancy, though I suspect that much of the difference is due to the difficulty in accurately synchronizing the pendulum and the hand clap and getting the right time interval – we are talking about a few milliseconds. Nevertheless, Newton gets credit for the first analytical determination of the speed of sound and for publishing his experiment and results in 1686, in Proposition 49 of Book II of the Principia. Sound reflecting from inside the Earth, à la Newton. Because of his measurement of the speed of sound, Newton also should be noted as one of the many grandparents of geophysics. 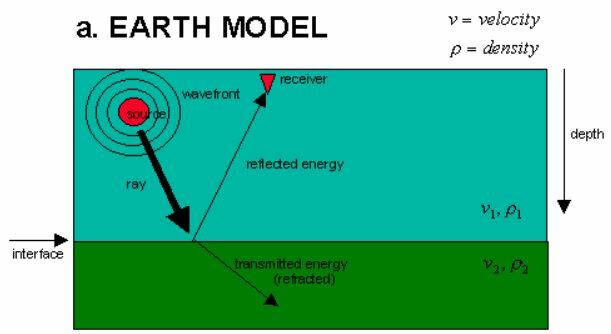 Modern seismic investigation is based on reflected sound waves. Sound, traveling through the Earth, encounters rocks of varying density and bounces back at each new interface. Such interfaces (rock formations) act like buried stone walls, echoing sound waves back to observers. By measuring the amount of time the reflections take, seismologists can infer the depth to layers and formations hidden underground. Not only did Newton perform the first speed of sound calculation, he also began the study of sound wave propagation and variation through different media – a fundamental property of seismic geophysics. As in all of science, the physics of seismology builds on prior work. And as in all science, experiments are verifiable – sometimes even with a 13-year-old’s clapping hands. This entry was posted in History, How Geophysics Works and tagged Cambridge, Newton, seismic waves, speed of sound, Trinity College. Bookmark the permalink. Sorry that you missed this! The adjacent library is worth a peak, too. When we were there, our guard was also a bit of a bully, but I suppose he had to maintain order over all the nerds showing up. My son was the only clapper among the bunch of us. I think the other visitors didn’t quite catch the significance.